I've looked at battery isolators and the cheap ones seem to connect the house battery once the starter battery/alternator circuit reaches a certain voltage. That would mean the starter battery is never completely charged before the house battery is connected. Anyways, I drew up below circuit (I'm not an expert so please excuse the low quality). My alternator is rated at 90A. The relay can only connect the house battery if ignition/engine and a manual switch are turned on. I can use the voltmeter reading to check if house needs charging and to make sure the starter battery has recovered before connecting the house battery. Would this simple circuit work or am I missing something? The diode in the drawing won't do anything to protect your start battery, as it allows current to flow from the start battery to the house battery any time that switch is closed. You might as well lose the diode. It doesn't help that now some are called "combiner-isolator"
In addition the combiner works BOTH ways... not only does it charge your house battery from the alternator, it will also charge the start battery from the solar panels. I used one on my houseboat for years and it kept EVERYTHING charged. They're also easier to connect than an isolator, and you don't have to mess with the existing wiring. 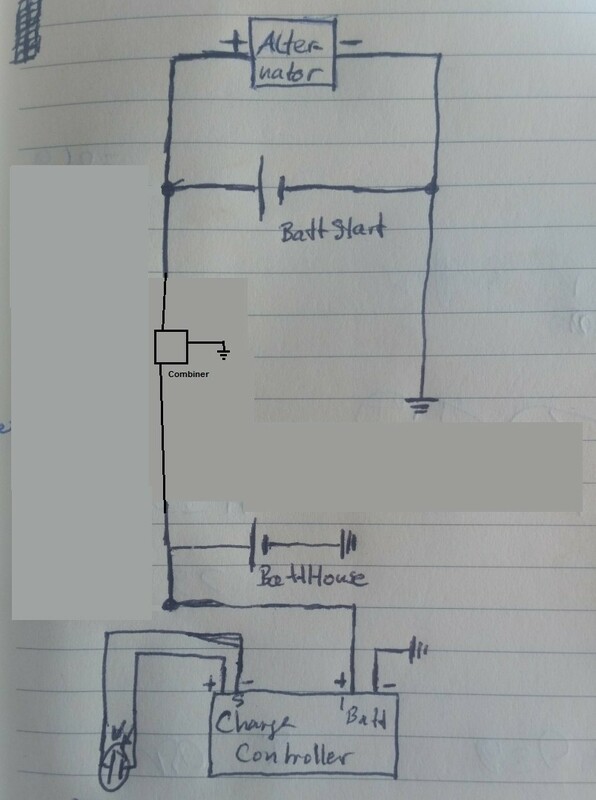 The house battery disconnect circuit makes to sense at all. Unless the starter battery and the house battery are the same battery. The two will form a unbalanced battery bank and one of the two will not charge correctly. If they are the same battery, after time they would become unbalanced because one is going to get worked more then the other. A better approach would be to charge the house battery with a charge controller that has a 12-14V generator input, the alternator connected to that input, and let the charge controller manage the house battery. Another thought: 90 Amps @ 14V = 1.2kW. One of them small 1000 - 2000W generators would recharge the house battery just as well as the alternator but with much better fuel efficiency. You can buy a lot of gas with the cost of a 1000-2000w portable generator, and they're designed to output 120v or 240v, not 12v. While they DO have a charging circuit, it's only good for a few amps. You'd be running that genset for a LONG time (and burning gas). I'm not sure it's that efficient. Running the main engine to charge the house bank admittedly doesn't make much economic sense, but if you're driving anyway, it works pretty well. At least it worked for me. At times I had the alternator AND the solar array charging simultaneously. As the batteries reached full charge, one system or the other would shut down. It was all automatic. I've never had an issue with the house bank and the start battery becoming "unbalanced", thought that MAY have been because the solar system was always keeping everything charged. At night or if voltage was low, the combiner automatically separated the two systems. It's much simpler, and it works. Note that the ONLY connection between the house and the start batteries is the combiner. You can put a manual switch (or a meter) in there if you like. While they DO have a charging circuit, it's only good for a few amps. Compared to a generator, PV panels are cheaper, quieter, and smell better. The van was a cargo panel van before the on version. So there isn't a charging circuit for 120/220V external power. I do like the battery combiner as it will keep everything charged from solar when the van is parked for a longer period. Just wondering why the item description of the Victron Cyrix-ct 12/24V 120 Amp lists max cranking Amps? Battery combiners are intended for charging, they are not intended to carry starter current. However instructions usually dictate connecting them with a couple feet of smaller gauge wire. The resistance of this wire limits the current through and protects the combiner. My combiner was only rated for 75A, but was still working perfectly when I sold the boat years later. Follow directions. Still not quite sure how cranking amps play a role than, but that's quite alright. The combiner will be sitting next to the house batt/solar charge controller at the end of the 5m long 10AMG wire. I'm just guessing that should be enough resistance? Not sure if a manual switch as originally planned makes any sense with these combiners. Would define the purpose as the starter battery would not be maintained. Maybe I'll put it one in to have the ability of making sure only house battery gets charged off solar when I need it. Today I noticed that the voltage on the solar charge controller went above 14.7V. For a while it was around 15.5V. I had set the float voltage to 14.7V, so I expected it should not go beyond that. Is the controller broken is it that normal behavior? If the combiner is closed, SOME of the cranking load will be on the combiner. The long run of 10 ga wire should limit this. You could also install an auto-reset circuit breaker. The diagram I found showed one. I do not see any need for a manual switch. The high voltage you observed is probably due to the controller being in "bulk" mode, which is higher than "float" mode. It is normal. As the battery becomes charged the controller should drop back to float mode.